Psychiatry specialists (from left) Professor Bonga Chiliza, Professor Lori Chibnik, Dr Saeeda Paruk of UKZN and Professor Bizu Gelaye. 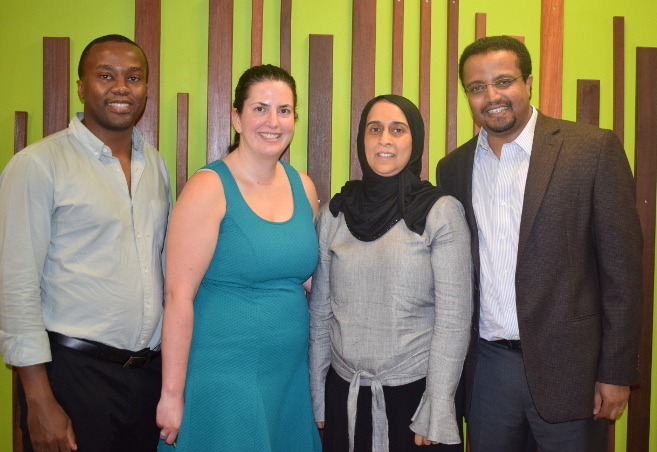 Researchers from Durban and Harvard University in the United States shared results of their latest research work in the field of Psychiatry at a seminar organised by Professor Bonga Chiliza of UKZN’s College of Health Sciences. The seminar was attended by representatives from UKZN, the KwaZulu-Natal Department of Health, the private sector and Professor Lori Chibnik and Professor Bizu Gelaye of Harvard. Chibnik is a Biostatistician and Assistant Professor with a joint appointment in the Department of Epidemiology at the Harvard T.H. Chan School of Public Health and the Department of Medicine at the Harvard Medical School. Her presentation titled: Neuropsychiatric Genetics in Africa: Growing Capacity by Investing in People, focused on her current research examining the genetics and genomics of Alzheimer’s disease and dementia with an emphasis on longitudinal cohorts. Gelaye is an Assistant Professor of Psychiatry and Managing Director in the Division of Global Psychiatry at Massachusetts General Hospital and Harvard Medical School. He is also an Associate Director at the Global Initiative for Neuropsychiatric Genetics Education in Research at Harvard. Although the research data Gelaye presented was from work done in Peru in South America, he said it was relevant for South Africa as the two countries had similar histories of armed internal conflict and political upheaval.